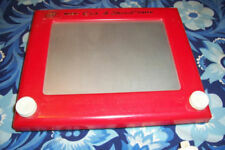 Etch A Sketch - Classic Red - NEW & SHIPS FREE! For more than 50 years, children and adults alike have been discovering the magical world of creativity and pencil-free drawing with Classic Etch A Sketch! Sketch, erase, and sketch again with Etch A Sketch. Etch A Sketch Magic Screen Keychain. It's the world's favorite drawing toy as a detailed,functional miniature, that you can takeeverywhere ! Just turn the knobs to form letters, pictures, charts and designs. Vintage ETCH A SKETCH No. 505 w/ Box Ohio Art. Chieftain brand. From SEARS. 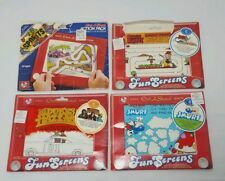 Up for sale vintage Lot of 4 Etch a Sketch Fun Screens. Dukes of Hazard (Complete) Smurfs (Complete) Sports (Complete) and Bugs Bunny (Missing 1). In used shape. Please look at pictures for best idea of conditions. Ask any questions. Thanks for looking. Will show wear and tear. PO BOX number. storage auction find. Cleaned tested. Smoke and pet free home. Fast shipping. Same day or next day shipping. Buy with confidence. Thank you and have a great day. Thank you for shopping at my ebay store were customer service is a priority.I strive to get great unique products that are in great clean Condition.Quality control is always a must.Items are always cleaned,washed,and tested.When items are purchased I always leave positive feedback asap.So please when you receive item and if your happy please leave positive feedback with 5 stars or if your not happy with purchase just message me and we will 100% work it out. Thanks again. Skedoodle is about 8.5" long. Box has moderate wear including. Dated 1981. and even the cardboard insert that goes inside the box. Used Condition but Working. Batteries are NOT included. 3 years & up. This classic Etch-A-Sketch will provide hours of pencil-free drawing. Etch a sketch animater. This item works but 1 row of pixels doesn't light up. I TRY TO TAKE DETAILED PICTURES AND SHOW ALL DEFECTS. Tested and works (see pictures). Size: 9.5" x 8". Pictures are of the real item. Works well. Copy-write date of 2006 may not be manufacture date. Looking for more Spongebob?. Condition is Used. Al l se ts a re c om pl et e an d th er e ar e 2 sc re en s th at a re b en t se e la st p ic tu re s.
Contains 6 plastic fun screens. This is a used item in mint condition. WE HAVE MADE MANY PEOPLE HAPPY ONLINE AND HOPE TO MAKE YOU ONE OF THEM. Fox gave this the the cast & crew for the 17th seasons gift. You had to work on the show to get one of these. NEW REMOVED FROM PLASTIC BOX (BOX HAS A FEW MINOR SCRATCHES). NEW in package, Etch A Sketch Magic Screen Wristwatch. Dated 1995 from Ohio Art Company. 4 Function Digital Watch flips up to reveal and a real working Etch A Sketch. Shipping is FREE and I ship to the U. S. only (lower 48 states). Screen has scratches. Wear to the gold logo. Case has color fading due to light exposure. Sound effects work great. Batteries are not included (requires 3 AA). Item is New in Package (See Pictures as depicted) free shipping with great protection and tracking information provided, messages me with any questions, thanks! This is approx. 10″x8″ the box has a small dent on one front corner. YOU WILL GET 1 ETCH A SKETCH AS PICTURED. - ETCH A SKETCH BY SPINMASTER. - WORLD'S FAVORTIE DRAWING TOY JUST DRAW & SHAKE TO ERASE! - THE ORIGINAL MAGIC SCREEN. Etch A Sketch by Ohio Art. Family friends are attending to the estate of their brother. Watch for much more over the coming weeks. For sale 1 World's Smallest Working "Magic 8 Ball". Works just like the full size version. Over 150 million sold! 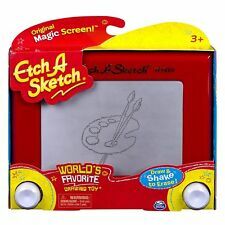 TheEtch-A-Sketch classic magic screen drawing toy is fun and easy to use! Pocket Etch-A-Sketch Drawing Toy. Turn both knobs together to draw curves. Pocket Size! Features of Pocket Etch-A-Sketch. 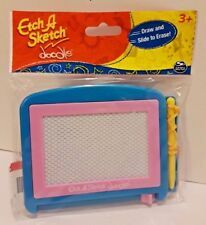 In Package Spin Master Pocket Etch-A-Sketch Miniature Size Drawing Toy. Condition is New. Shipped with USPS Priority Mail. Otherwise in really good shape. Pocket Etch A Sketch. The perfectly portable, pocket-sized Etch A Sketch may be small in size, but it's big in fun! It's easy for small hands to hold, so you can get your kids started early learning how to draw perfect circles with two little knobs. Vintage Etch A Sketch Action 6 Pack Rare Mickey Mouse Reusable Fun Screens 1982. Ohio art. 6 screens. Used but very good condition screens. Some damage and wear to the packaging as shown in pictures. Trending at C $31.50eBay determines this price through a machine-learned model of the product's sale prices within the last 90 days. Preowned and in great condition. Sheets are in excellent condition and colorful. Etch A Sketch 12 Games Puzzles Screens Sheets Overlays Ohio Art H. Condition is Used. Shipped with USPS Priority Mail. Good condition missing slides but still perfect to draw with. Classic Drawing Tool for Girls and Boys. Play in the House or while Traveling. etch a sketch electronic 1986 vintage works? Ohio Art co.
Etch A Sketch toys are a fun game without the need for a digital connection, reams of paper, or pencils that need constant sharpening. Indulge your imagination with this drawing toy that easily and completely erases in seconds for the next creative image to come to life. Etch A Sketch games allow you to draw an infinite number of images to keep up with your creativity. What is an Etch A Sketch toy? 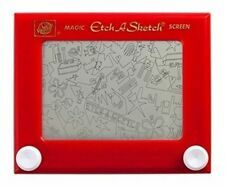 The 1960 release of the Etch A Sketch introduced it as a mechanical drawing toy with a thick, grey, glass screen inside a plastic red frame with two small white knobs. The knobs are twisted by hand to adjust the metal pointer, or stylus, under the screen in order to create a drawing, or sketch, with the powder contained inside. You then turn the Etch A Sketch upside down and shake it to erase the image and can immediately draw a new sketch on a blank slate. How does an Etch A Sketch toy work? Inside the Etch A Sketch toy is aluminum powder fully coating the screen in order to draw a sketch. As the knobs are turned, the left one for horizontal movement and the right one for vertical movement, the stylus continues to push the powder away. The displaced powder leaves what appears to be a black or dark grey line on the Etch A Sketch display, but in reality it is just the empty space inside the Etch A Sketch. This effectively creates your sketch as you continue to adjust the knobs for vertical or horizontal movement. When you shake the Etch A Sketch, polystyrene beads help coat and redistribute the aluminum powder over the inside surface of the display. What are the benefits of drawing with Etch A Sketch? Lineography is the act of drawing without lifting the medium from the surface. The Etch A Sketch is a lineographic toy; the stylus is able to move horizontally and vertically but not be removed from the underside of the display. The benefit of the Etch A Sketch is that you are able to release your hands from the toy as often as needed with the ability to pick back up exactly where you stopped. This action mimics the motion of drawing with a paintbrush or pencil. Another benefit of the Etch A Sketch is that your hands will remain clean throughout the drawing process.